In December of 2010, I visited and worked out of Hyderabad city in India for 3 weeks. My last visit to Hyderabad was 5 years ago and this time it seemed like the city has been on a fast track literally and otherwise in terms of growth and infrastructure development. The airport is truly world class with its magnitude of space and comforts. The roads leading you to the city from the airport compare with the US freeways with the only exception being official speed limits imposed! :) The Hitech city, where I spent most of my work time, has grown tons of times its size 5 years ago with hundreds of corporate offices of Indian and foreign tech companies and educational campuses like ISB and shopping malls and restaurants and the likes.. During this stay, I also visited several tourist spots of the city and my experience was surprisingly spread across a wide spectrum of emotions. Each place had a charm of its own that was either pleasantly reflected in the energy around it or dishearteningly lost among the camaraderie of crowd and its mundane activities in the arena. Here is my mini-guide for tourists who visit this city with my lens. Charminaar and Chudi bazaar and Laad Bazaar: These beautifully carved minars (pillars) at the crossroads of one the busiest junctions of the old city is worth a visit to wonder how lonely and neglected a structure of such historic and architectural significance might be! You need to do some ground work before you can brace yourself to shop in the crowded markets, that are most known for pearls and bangles, along the Charminaar crossroads. Warnings of cheating on price and originality of those gems float around in plenty especially if you are an accented English speaking, camera holding admirer of Charminaar's intricate design. Golconda Fort: The Sound and Light show in the evenings at this huge fort is an experience I will never forget. In the voice of Amitabh Bachan, this show takes you back in time to the days when this fort was full of life and riches and a symbol of strength and power. Hussain Sagar Lake & Buddha statue: My only low point on this happening area of the city is the strong stench of the stagnant lake water that is quite discomforting after a while. The good news however is that the largest monolithic Buddha statue in the country at the center of this lake is only 10 minute boat ride away and absolutely worth a visit. Eat Street: This is the most happening food place in the city with a variety of options from Mumbai Frankie to South Indian dosas to Indo-Chinese to MacD to Chaat and several more... They have a comfortable common seating area facing the lake. This place offers some great night shots of the lake and a ride to the Buddha statue as well. Chowmallah Palace: This is a group of beautiful well-maintained palaces built by successive Nizams. The collection of photographs, crockery, furniture, apparel, currency, weapons and many other royal artifacts including the royal throne in a room roofed under magnificent chandeliers is very interesting. Ramoji Film City: The film city is huge and can easily consume an entire day worth of time exploring. It has amazing sets in the form of replicas of India's most famous monuments, boasts of a variety of gardens each with its own theme and color, and an arena full of demonstrations of the tricks of the film world. Since I have been to film cities of the likes of Universal Studios, I should have reset my expectations from film themed rides and shows to outdoorsy exploration of natural but not original lawns and parks sets to feel content with this plan. 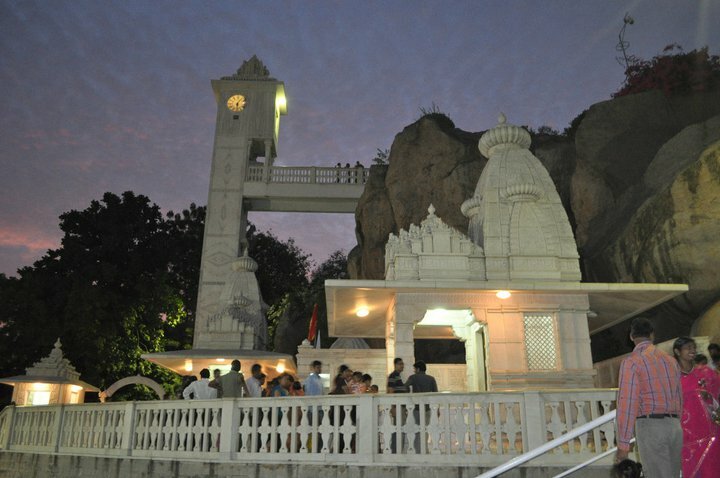 Birla Temple: Built at a height this temple offers a view of the entire city spread around the lake. The different levels of the temple connected with quite some flights of stairs have a unique layout and magnificent sculptures on the walls. Qutubshahi tombs: These are domed structures built on a square base and reflect a blend of Indian and Persian architecture. If Charminaar's neglected state can cause any bout of pain, then these tombs will only make one cry for the lack of maintenance and solitude these endure. Salar Jung Museum: This is one of the oldest museums in the city and has the largest compilation of personally collected artifacts from all around the world. It has hundreds of rooms and requires a lot of time and patience to see each artifact at ease. Snow World: A big room full of artificial snow, a dirty ice-slide and an igloo and maintained at a temperature below the freezing point is no fun for the ones who have had the experience of snowfalls for entire winters. This place was the biggest letdown of my trip and a complete negative experience being a part of hundreds of visitors packed together in an environment that lacked hygiene and discipline. A visit to Hyderabad is not complete without eating the famous Hyderabadi biryani. The most popular Paradise restaurant and Zafraan Exotica with awesome ambience and tasty food were among my favorite biryani places. Based on my trip experience my last thoughts on this city - it is now ruled by rickshaw drivers who impose exorbitant fares for rides and tourists like me have no option but to obey their HIGH command!!! My favorites Live in Concert!! !